As a freelancer, I work about half the time in “the office” (whichever company I’m working for at the time) and the other half from home. I have yet to totally master the latter, but here’s what I’ve worked out so far. 1) Don’t “work” in front of the TV. 2) Don’t make The Dip. The Dip is my friend Cindy’s melty, cheesy concoction of deliciousness that you eat with tortilla chips. There are several reasons not to make The Dip. The first is that you will gain about 3 lbs a week. The second is that you can’t eat The Dip while working on your laptop because it’s melty and cheesy and therefore messy, so you end up taking a TV break whilst eating it, which violates Rule #1. If you’re thinking I made The Dip just to provide an illustration of what not to do, you’re correct. You’re welcome. 3) Make yourself a schedule and stick to it. The great thing about working from home is you don’t have to work 9-5 if you don’t want to. You can work 8-4 or 10-12 or during those “fast forward and other functions may not be available” times while watching the Bachelorette on demand. But if you’re billing eight hours, you have to work eight hours. But I’m at home and no one’s gonna see me all day! No, friend. Eventually, you’ll need to pick up kids or buy cheddar cheese (not for The Dip, of course) or buy salsa (also not for The Dip, what are you, The Dip Police? ), and you’ll have to face the outside world. Also, showering first thing in the morning helps you stick to a schedule (see #3). I wish I had a true home office, but our home office became George’s room about five years ago, and until he stops singing The Imperial March for 45 minutes every night before he goes to sleep, my kids won’t be sharing a room anytime soon. So for now, I use our kitchen table. I like it because it forces me to have minimal stuff, as I need to set up and then clean up my office at the beginning and end of each work day. If you’re working, you should be reachable by email, cell and other formats your employers use. On my current project, that means being on Skype when I’m working so I can chat with my art director partners or producers and communicate urgent things like this puking emoji when the client rewrites my copy. Just kidding, I love client rewrites. 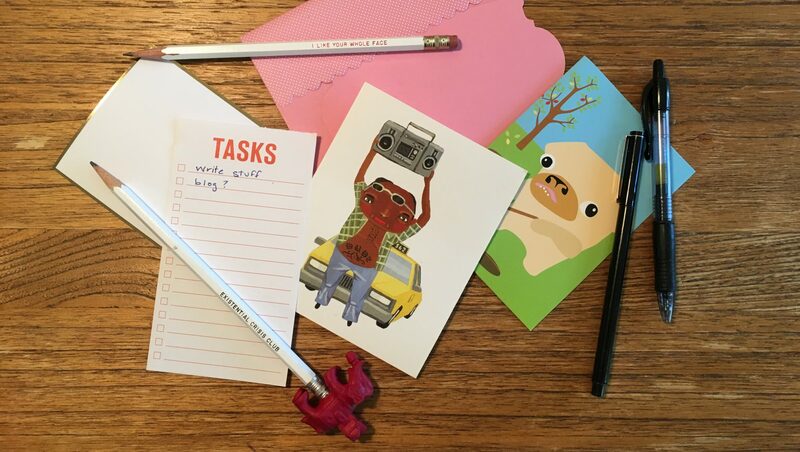 To-do lists are 1) satisfying, and 2) keep you from forgetting projects. Of course, sometimes I’ll forget to put something on my to-do list, but hey, nobody’s perfect. I write mine in this cute planner that makes me inexplicably happy. I can’t show you an actual to-do list because each one has at least one embarrassing thing on it I don’t want to share. It’s tempting to try to do it all when you’re at home: throw in a load of laundry here, KonMari your closet there. But keep in mind, there’s no PO# for giving poignant goodbyes to your t-shirts. 9) Keep a strict log of your hours. When you’re billing by the hour, you really can’t wait until the end of the week and do some half-assed guessing at how many hours you spent doing the copywriting equivalent of making the logo bigger on Monday. 10) Every once in a while, give yourself a day off. Isn’t that the point of being your own boss? Go to your happy place (Hello, TJ Maxx/HomeGoods), catch up on your shows (if you’re not watching the Handmaid’s Tale, start your free Hulu trial and get to work), and sit down with The Dip. You’ve earned it. What else did I miss? Take it to the comments section. I want “The Dip” recipe please. – Asking for a friend. I’m gonna have to send it to you privately. I can’t unleash it on the world; it’s irresponsible.